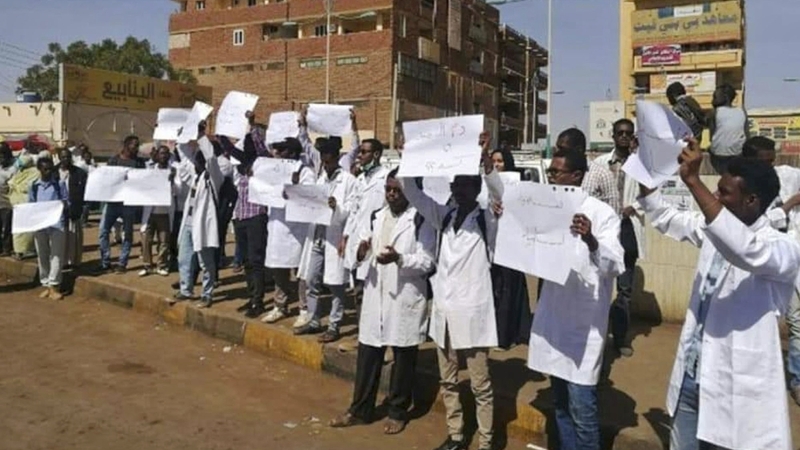 Trade unions and professional associations in Sudan have called for a nationwide work stoppage to protest against price hikes and worsening economic conditions, as doctors vowed to continue their indefinite strike. Sudanese doctors launched strike at 8am on Monday, according to activists, but said they would continue to deal with emergencies as the deadly protests entered its sixth day. At least 12 people have been killed in protests that erupted on Wednesday. Opposition groups, however, claim that at least 22 people have been killed in the unrest that has swept across the north African country. The Sudanese Professionals Association, an umbrella coalition for professional unions, called for a march on Tuesday from Abu Janzir Square in central Khartoum towards the presidential palace demanding President Omar al-Bashir step down immediately. In a statement published on Sunday, the coalition said that it would submit an official demand on Tuesday for the “president’s immediate resignation in response to the uprising by the Sudanese people… (and the) formation of a transitional government”. The Sudanese government on Monday assured that it will carry out economic reforms to “ensure decent living for citizens”, according to the official Sudan news agency, in its first comment since the protests began. “The state will take real reforms to guarantee a decent life for citizens,” said Bashir. The coalition brings together syndicates and professional bodies that represent Sudanese doctors, lawyers, journalists, veterinarians, university professors and engineers. Sporadic protests continued in Manaqil and Rufaa cities on Monday, according to AFP, while bigger protests erupted after a football match in Omdurman, a suburb of Khartoum, on Sunday night. Football fans leaving the match chanted slogans against the president and clashed with police who used tear gas and rubber bullets to disperse the fans, according to activists. Video clips posted online showed them chanting “the people want to bring down the regime” – one of the main slogans of the Arab Spring uprisings. Sudanese authorities have maintained a state of emergency in a number of provinces, while schools and universities continue to be suspended in an attempt by the government to limit the escalation of protests. There have also been reports of limited access to social media platforms including Facebook and Twitter. Meanwhile, Sudanese communities abroad have organised protests to show their support for demonstrations in their home country. “The Sudanese diaspora feels very strongly about what is happening in Sudan,” said Wafa May Elamin, a Sudanese-American activist, and co-organiser of a demonstration that is to take place at the Sudanese embassy in Washington DC on Monday. “We hope to shed light on the issues facing people in Sudan, and gain the attention of the international community,” she told Al Jazeera. Insaaf Abbas, a Sudenese-British activist told Al Jazeera that members of the Sudanese community also held a demonstration in central Manchester, in northwest England, earlier on Monday. “We are protesting to show our support for Sudan and to raise awareness in international media about what’s happening there,” said Abbas. Other protests are planned to take place in several cities over the next few days across Canada, the US, Australia and the UK, according to British and American Sudanese activists. The United States lifted its 20-year-old trade sanction on the country in 2017, but Sudan’s economic woes have continued to exacerbate in the past few years. The country of 40 million people has struggled to recover from the loss of three-quarters of its oil output, which was its main source of foreign currency, when South Sudan seceded in 2011. Although initially the protests appeared to be tied to a recent increase in the price of a loaf of bread from one Sudanese pound to three, analysts believe the people’s grievances run deeper than that. “The trigger of the protests was the rise in bread prices, but underlying these protests is a long-standing public discontent over the economic and political policies of Bashir’s regime,” Mohamed Osman, an independent Sudanese analyst, told Al Jazeera. A wave of protests erupted across Sudan in September 2013, after Bashir announced an end to fuel and other subsidies. Tens of people were killed in the protests, according to government estimates, while activists say fatalities were in the hundreds. “Also, in terms of geography, the previous demonstrations were concentrated in Khartoum, where the government maintains a strong security presence. This week’s protests started in the northern states which are the heartland of the trade unions as well as Bashir’s ethnic base,” Osman, the analyst said. The ruling National Congress Party said it understands the people’s anger over the economic situation, but spokesman Ibrahim el-Sadik accused Israel and “left-wing parties” of being behind the protests, according to AFP news agency. On Sunday, the Sudanese military reiterated its support for al-Bashir in a statement, saying that it “stands behind its leadership”, according to the official SUNA news agency. This came after some senior military officers had reportedly joined protesters in the cities of Atbara, Gadarif and Port Sudan.